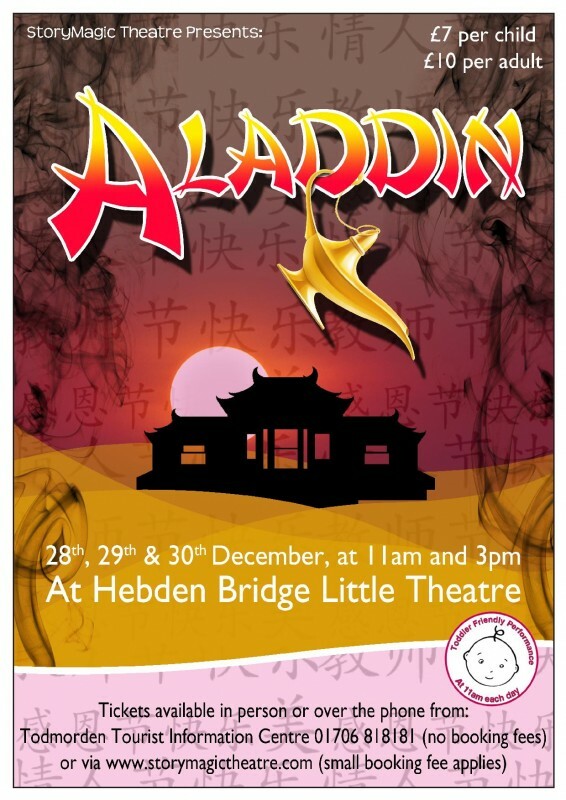 Aladdin flies into Hebden Bridge this December for StoryMagic’s annual pantomime at Hebden Bridge Little Theatre. Performances are on 28-30 December, at 11am and 3pm. Last year’s pantomime, Snow White, sold out leaving families disappointed, so audiences are urged to buy their tickets well in advance this year. ‘Our popular Toddler Friendly performances are back at 11am every day’ says producer Katrina Heath. ‘These performances are specially designed for a very young audience, so we make sure it never goes dark, and we avoid scary effects and loud noises’. The cast includes 3 professional adults. Regular audience members will recognise Katrina and Ross from the past few years, and local actress, Rhiannon, who played Snow White last year joins us as the Princess Balroulbadour. The cast is completed by 7 local children who play street urchins and magical dancing rubies, amethysts and an onyx in the ballet of the jewels. Tickets are available at Todmorden Tourist Information Centre, either in person, or on 01706 818181 (no booking fee), or by clicking on the Ticketsource link on the website www.storymagictheatre.com (a small booking fee applies). STOP PRESS: Extra performance announced, Monday 31 December at 3pm.